On the village map of 1778, Morley's Homestead is marked. Christopher Morley was in the village in 1761 when his first child, a daughter, was baptised, so he could have been in the Grange at that time. The house was actually named on Howlett's engraving of 1807, which shows it with two rows of trees forming an avenue approach. If one of these rows was along our present main road then the house definitely had a south facing aspect as on the 1778 map. Morley died in 1825 aged ninety-one years. A Mr. Caparn, solicitor, was the occupier in 1343 and Richard Smith was at Grange Farm, now the inn car park. In the 1861 census, Mrs. Francis Caparn was the occupier. Mrs. Elizabeth Branston was in this prop­erty in the 1869 census. 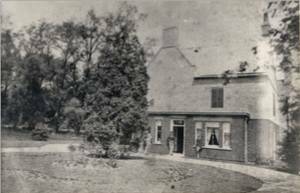 Her son, Joseph Gilstrap, newly married, was at 24, South Parade, Newark, in the original family home. After his mother's death "J.G." built the "new" Grange, 1876-8. This building of red brick had its front door and the main rooms facing our present main road. The original old Grange was joined on at the rear. A recently discovered photograph exists to prove this. Two drives approached the house, one from near the entrance to the Spinney. This shows in the lawn of "The Lodge", (Mr. Burkitt, 1986), which was the coachman's cottage. The second drive went from Mr. Stone's present gate and both drives curved round to the front of the houses. Along the roadside were a fence, hedge and shrubbery, which included a row of yews, still there today. The great elms shown on the engraving of the old Grange were next and then came grass, which in springtime was yellow with primroses and wild daffodils. Along the roadside from behind the lodge were stables and coach houses, a high wall concealing all from view. All the land right down to the stream was grass with beautiful beeches and elms, while across the stream was a mixed woodland, the floor of which, in spring time, was covered with snowdrops, crocuses, wood anemones and later was bluebells. "J.G." continued to live here until his death in 1926, when the estate went up for sale. Colonel H. Higgs purchased the Grange and its surrounding land in 1928. Unfortunately he died at a very early age, but his widow and family continued to reside there. Mrs. Higgs died in 1954, when Fosters, a building firm, purchased the site, demolished the Grange and in 1955, began to build the present Spinney Estate. The Village and its Housesin Voume 1.